The post “Diamonds Always Shine or Reviewing Art Submissions by the Ton” generated some interesting responses. I’d like to expand a bit on the reply I made to Roy Richardson’s comment. Roy teaches comic art at the Savannah College of Art and Design (SCAD) in Atlanta. He wanted me to expand on how editors at Marvel were hired and why a few of them seemed ill-suited for the job. Keep in mind that my comments generally refer to the period I was on staff at Marvel (1983 – 1996). The comics market grew substantially during most of that period. The editorial staff expanded accordingly as Marvel increased the number of publications it produced. During that time, there was also a fair amount of staff turnover. So, the total number of people who were part of the Marvel editorial staff during that period was quite high – many dozens. Also keep in mind that, despite the problems outlined below, the majority of those who served on Marvel’s editorial staff during my time there were, for the most part, good people doing a good job. There were only a relative few I’d classify as being highly unprofessional. Those relative few either didn’t possess the necessary aptitude or skills or had substantial negative attitude and/or other personality issues. Some assistant editors transferred in from other positions and departments within Marvel. Occasionally, someone on Marvel’s staff would recommend a friend for an open assistant editor position. Many Marvel editors began as high school or college interns who worked at Marvel for school credit. Ohio’s Antioch College seemed to always have students interning at Marvel. Antioch was the alma mater of Marvel’s president at the time, Jim Galton. 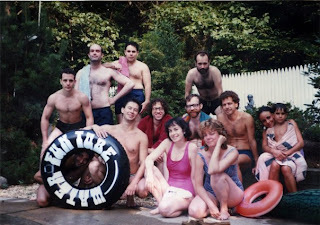 Over the years, a number of Antioch interns ended up on Marvel’s editorial staff including Marie Javins, Sara Tuchinsky, Andrew Perry, Kevin Somers and Polly Watson. This was, in general, a good system. It meant Marvel’s editorial staff had a nice mix of experienced vets who could oversee the development of new editorial staffers. The new editorial staffers brought new enthusiasm, ideas and aesthetics with them. In addition to whatever day-to-day hands-on experience the assistant editors acquired in the editorial office they worked in, they attended weekly classes for assistant editors. 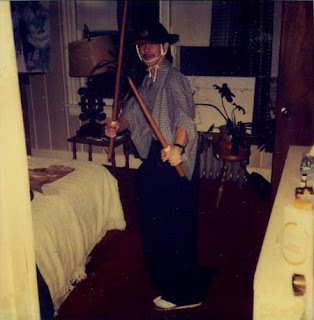 Executive editor Mark Gruenwald ran those classes. He sometimes had guest speakers present to the class (including Tom DeFalco, Bob Budiansky and me.) When Marvel added the associate editor position, I oversaw the training classes for that position. -As Marvel and the comics industry in general grew through the ‘80s and early ‘90s, Marvel had to expand its editorial ranks to accommodate the additional publishing workload. A few people were promoted before they were ready due to the need for staff expansion created by the growing market. Some of those who were promoted before they were ready would have made fine editors if they had been allowed to grow and hone their skills at a lower editorial position. -There was also a mistaken assumption that anyone who made a good assistant editor would automatically evolve into a good editor. People were sometimes promoted beyond their level of ability or comfort. Each position up the editorial chain (Assistant Editor, Associate Editor, Editor, Group Editor, Executive Editor, Editor-in-Chief) had additional creative and management responsibilities attached to it. A good assistant editor didn’t always have the aptitude to climb that ladder successfully. -There was a period when then EIC Jim Shooter decided that he wanted to bring in some “blank slates”, non-fan boys that he could train to do things his way. This approach yielded disappointing results for Shooter and everyone else. In a somewhat related approach, during the early/mid ‘80s, DC hired some experienced prose novel editors with the idea that they could be trained to become comic book editors. Editing a visual storytelling medium is very different from editing prose (and vice versa). I don’t believe any of those editors lasted very long in the comics field. That doesn’t mean this approach couldn’t work. It just means that the candidates should have been screened for having an aptitude for visual storytelling. -Most of those who joined the Marvel staff were comics fans, sometimes highly opinionated and naive comics fans. With experience and maturing over time, their love for comics could be combined with best practices and professionalism. Occasionally, someone came on staff with a naive know-it-all attitude and never woke up to the fact that they didn’t know it all. -Some otherwise great editors had their sense of aesthetics stuck in an earlier time period. There were a lot of people who got into the business during the late ‘70s and early ‘80s who maintained their late ’70s aesthetic sensibilities as the world, and the comics audience, changed around them. Ideally, an editor should be aware that the audience’s aesthetics are changing and ride that fine line between being contemporary without trying to be too trendy. -Except for the latter part of Shooter’s reign as EIC, it was actually pretty hard to get yourself fired from Marvel's editorial staff. I witnessed one editor repeatedly exhibit gross dereliction of duty. That editor was “taken to the woodshed” by his superior many times over an extended period before finally being fired. I too was reluctant to end anyone’s editorial career, so I have to take the heat for not pulling the trigger quickly in a couple of situations. I had to be pushed hard by one editor’s long series of professional and ethical blunders to finally put that editor on probation, a probation the editor ultimately failed. In another case, an Assistant Editor showed such bad judgment, unethical conduct and insubordination that I should have quickly axed him/her. However, the assistant’s pleas, and the support of that assitant's supervising editor, stayed my hand, allowing the assistant to repeat the offenses. -Some editors were very strong in certain skill areas and almost useless in others. Someone could be a great plot and dialogue editor but couldn’t give an artist useful feedback on how to execute clear visual storytelling. Or, they might have great creative editing skills but were weak when it came to managing teams, projects and schedules. Again, I want to make it clear that, out of the many dozens of editorial staffers who worked at Marvel during my time there, there were relatively few who did not do their job well. Marvel also was blessed with a high number of exceptional editors and I was blessed with the opportunity to work with many of them. Marvel was a fabulous place to work and the vast majority of us working there couldn’t have asked for a better job or, during the latter ‘80s through the early ‘90s - the Hobson/DeFalco era, a better corporate environment to work in. We loved what we did and enjoyed hanging out together during and after work hours. *Shooter hired some editors from “outside” Marvel around 1980. By outside, I mean they did not work their way up Marvels’ editorial ranks. They were hired as full editors. 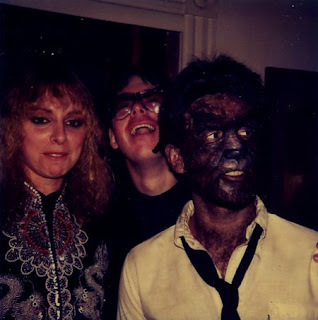 These included Denny O’Neil, Al Milgrom, Louise “Weezie” Simonson, Larry Hama and, in 1983, me. Denny had a long editing and writing resume in the comics business. 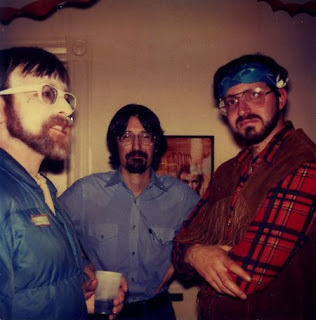 Al and Larry, both artist/writers, had served short stints as editors at DC. Weezie had been in charge of editorial at Warren Publications (Creep[y, Eerie, Vampirella) I’d spent a lot of time in the advertising biz which, combined with my limited comics creative output and endorsements by several key people, impressed Shooter enough for him to ask me to join the staff. There were also a few cases of former Marvel assistant editors leaving staff to work freelance for a while before returning to become staff editors. Bob Budiansky and Danny Fingeroth come to mind. When I was trying to break into the comicbook business as an artist, I was frustrated by the responses, or lack thereof, to the submissions I mailed to the various editors. 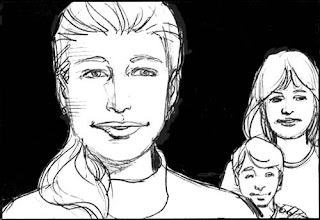 My submissions consisted of Xeroxes of story pages and character pin-ups. I couldn’t see it at the time but my drawing was weak and the visual storytelling even weaker. In some cases I’d get no response at all from the editor. Others would eventually send a “thanks but no thanks” form letter that contained no information on why the work wasn’t up to snuff, or what I could do to improve it. That’s not surprising. Editors are generally very busy and are under no obligation to give detailed responses (or any response) to unsolicited submissions. 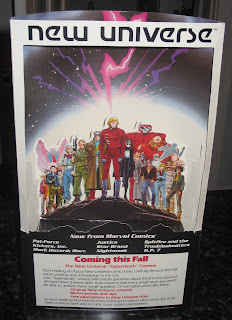 Years later, I joined Marvel Comics’ editorial staff. Due to the frustration I experienced when I was mailing samples to editors, I decided to respond to every submission I received. The office I inherited contained a large stack of unopened submissions, so I started there. It was like going through a mountain of coal and finding a diamond. 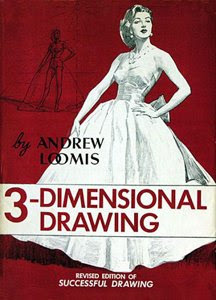 Adams was the first of a number of talents I discovered in the submissions that poured into Marvel daily. Since many of the submissions had similar weaknesses, I worked out a set of response letters to cover most situations. The letters were easily customizable so each response could be quickly tailored. 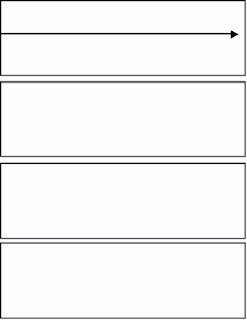 When Scott McCloud’s Understanding Comics - The Invisible Art was released, that title was added to the list. There are Amazon links to all of these tiles along the right side of this blog. Years after I left Marvel’s staff, artists still come up to me at conventions and express thanks for the drawing exercise and book recommendations they received when they sent submissions to Marvel. My office became known as the place to send your samples if you wanted to get a response. So, the number of unsolicited submissions increased dramatically. More mountains of coal with the occasional diamond mixed in. I was careful not to tell artists of even the weakest work to give up drawing, even if I felt pretty sure they’d never be good enough to be hired. Some editors and established artists sometimes bluntly told would-be comics artists to give up drawing and go into some other pursuit. A menial job (digging ditches, pumping gas) was often suggested as an alternative career. These harsh reviewers had an interesting rationalization for their approach. Supposedly, if the would-be artist had the determination needed to improve his/her work to a professional level, he/she would get mad at the insulting remarks and try their best to prove the reviewer wrong. That approach can work with some personality types but not others. It’s very possible that some extremely talented artists with very meek personalities were emotionally crushed by such comments and gave up drawing. In such cases, a more nurturing approach would have been more productive. Insightful constructive criticism combined with targeted drawing exercises and research suggestions should do the trick for most personality types. When Barry Smith (aka Barry Windsor Smith) began drawing comics for Marvel in the late 1960s, his work looked extremely amateurish to me. At the time, I thought that Smith would never amount to anything and would probably disappear from the scenes as soon as Marvel found someone else who could hold a pencil. Smith, however, continued getting assignments from Marvel. Over a year or so, Smith’s work didn’t improve much. He finally kicked into high gear when he was assigned to the Conan comic where he rapidly developed into one of the better artists of his generation. The change in the quality of Smith’s work was amazing. Smith’s dramatic example makes it almost impossible for me to tell an artist of even the weakest work that they should give up their dream of ever drawing professionally. -The odds of him/her making it to a professional level were extremely poor. -Their only chance of reaching that goal will require hard work every day for years. -They must decide if they have the dedication to put in all of that hard for just a small chance of making it. Sometimes a little bit of knowledge is worse than no knowledge. This is true when reviewing art samples. One editor in particular comes to mind. He’d been observing me giving reviews at the Marvel’s booth at the San Diego Con and picked up on some catch phrases I used. He then began reviewing portfolios at the other end of the table I was sitting at. However, when I stopped to observe him more closely, it was clear that the editor was using my terminology and phrases out of context, giving the artists some confusing and very bad advice in the process. The young artists had just been given criticism and advice by a Marvel editor and I was worried that they might not know enough to dismiss the editor’s bad advice. So, I memorized the faces of some of these poor artists and later tried to track them down and “deprogram” them. The work involved in reviewing and responding to all of the submissions the mailman dropped of daily was considerable, but then so were the rewards. Many talented diamonds turned up. Helping people to improve their work and begin successful careers was very satisfying for me. I wonder what would have happened to my own artistic progress if someone had responded to my early submissions with solid criticism, advice and reference. *I showed Art’s samples to my assistant editor, Ann Nocenti. She had been working on a new character and was looking for an artist to work with. 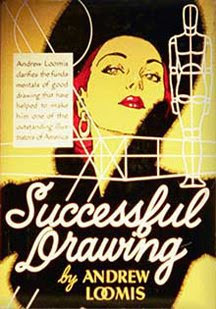 Ann and Art eventually produced the Longshot limited series that helped launch both of their creative careers. **I’ll go into some of these exercises in a future entry. I was going to get back to visual storytelling or design this time around. 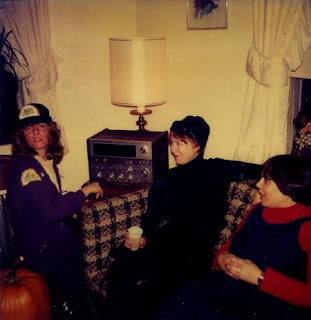 However, I ran across some old Halloween photos and since that time of year is upon us, I thought I’d share them now. 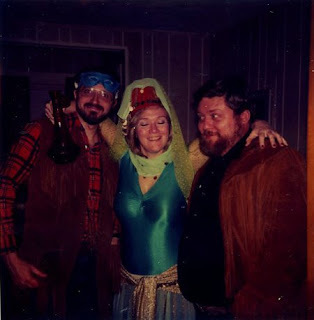 During most of my years at Marvel Comics, there would be a Halloween party in the office. Many of us would attend in costume. 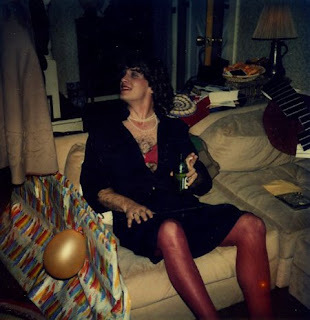 Mark Gruenwald was a major force behind these office events. 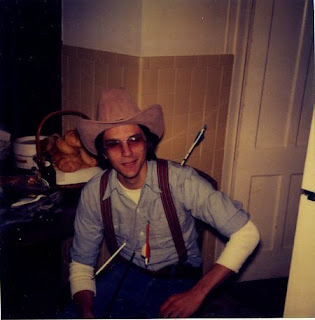 The photo below is from either 1985 or 1986 when I was an editor. I’m in my Alien Legion costume. With me is my fabulous assistant editor at the time, Pat Blevins. 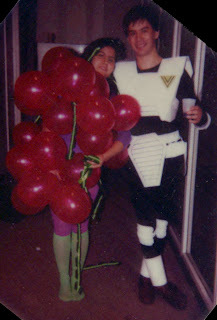 Pat is dressed up as a bunch of grapes! Pat is the wife of the very talented artist, Bret Blevins. Both Bret and Pat are among the nicest people on the planet. I enjoyed working with both of them a lot. 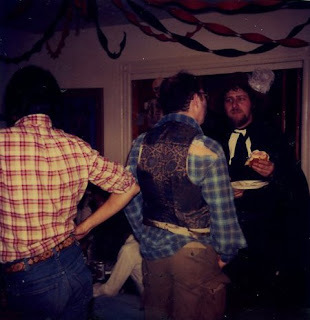 During the ealry 1980s, when Bernie Wrightson lived near Woodstock, NY, he hosted an annual Halloween party. Much of the comics community attended. 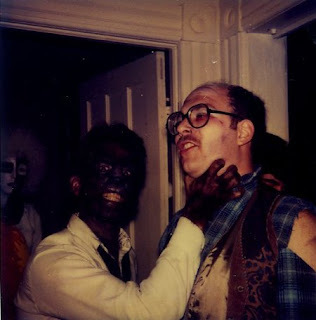 The shots below are, to the best of my knowledge, from Bernie’s Oct. 1982 party. It always baffled me as a kid when people told me that could not tell the difference between the art styles of various comicbook artists. To me, most of the artists creating the comics that I devoured had very distinctive styles. How on (or off) Earth could anyone not see the difference between the styles of Neal Adams, Alex Toth, Joe Kubert and Jack Kirby? Apparently, if it’s in a comicbook, a lot of people see through invisible filters that render everything into a homogenized Roy Lichtenstein-esque aesthetic. When I was reading early Marvel Comics, the work of Steve Ditko really stood out and inspired me. He co-created Spider-Man and Doctor Strange, my favorite Marvel characters. Ditko’s work was like no other comics creator at that time. For the most part, his characters were not idealized in their appearance. * The everyman-who-can-be-identified-with-by-anyone look for Peter Parker that Ditko created helped Spider-Man comics attract legions of empathetic readers. Steve’s characters moved in unique poses and with unusual gestures. Spider-Man swung and leaped just like a Spider-Man should and Doc Strange’s spells were cast unique hand gestures. Doctor Strange on the defense. He created a fantastic visual language for casting magic spells that is still emulated today. Steve’s philosophical beliefs were as unusual as his art style. As the 1960s progressed, Steve became more and more entrenched in Objectivism, a very strict and uncompromising philosophy championed by author Ayn Rand. These beliefs are a major reason why Ditko left Marvel at the height of his popularity. 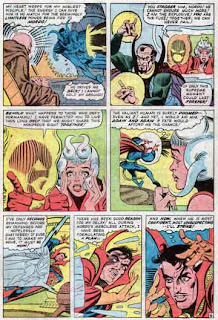 By the time he left Marvel, Ditko had stopped giving interviews, signing autographs or attending comics conventions. When I moved to NY about a decade later, I figured I’d probably never get to meet him. 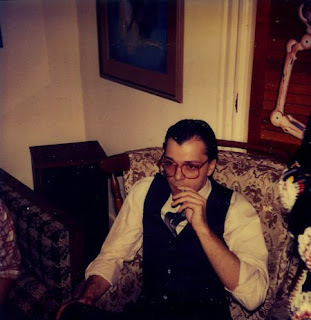 However, around 1978, Neal Adams convinced Ditko to attend one of the monthly gatherings of NYC-based comics community that Neal hosted at his midtown apartment. It was there that Jim Starlin introduced me to Steve. I was pretty much tongue-tied but must have not made too horrible of an impression since Ditko occasionally stopped by to visit me when I became a staff editor at Marvel. By that time, Ditko had been back at Marvel for a number of years. Ditko had some rules about the jobs he’d consider during the ‘80s. He wouldn’t work on stories featuring Spider-Man or Dr. Strange, the characters he rose to fame on in the early ‘60s. He also wanted to only work on stories where the heroes didn’t have major flaws or weaknesses (hard to do since that described many of Marvel’s heroes!). One of the jobs Ditko agreed to draw for my office was in the first issue of What The--? !, Marvel’s self-parody humor comic. Ditko had drawn short humor jobs in the past so I asked him to do one for our first issue. He was up for it as long as only villains were the targets of the jokes – Ditko felt making fun of true heroes was not appropriate. So I asked Mark Gruenwald to write such a story parodying Secret Wars. He did so (under a pseudonym) and legendary comics artist John Severin agreed to ink it. During his occasional visits at my office, Ditko would talk at length on a variety of subjects but he’d really get going if the conversation turned to politics or philosophy. He was indeed a true believer in Objectivism and that belief seemed unshakable. In the late ‘80s, Ditko told me that, when he quit Marvel in the ‘60s, he didn’t turn in two Dr. Strange stories that he’d plotted and penciled. 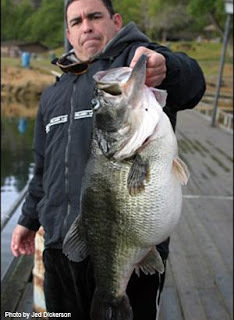 My jaw hit the floor. This was amazing news and I urged (begged) Ditko to bring in the story! He politely declined, saying he didn’t want the pages to ever be published or copied. I told him that I’d be happy to look over his shoulder as he flipped through the pages/ That way the pages would never leave his hands, but he still declined to bring them in. Since then I’ve fantasized about what those pages look like and what the story was about. I wonder if I’ll ever find out! Also during one of his visits to Marvel, I asked Steve to sign a page of original Creeper art I’d bought at a convention years before. His reaction that day and a few weeks later when he returned to my office were very memorable. If you want to hear that story, it’s at the end of the audio recording of a panel on Ditko that author Blake Bell moderated at the 2008 San Diego Comic Con. Blake’s recently published hardcover book, Strange and Stranger: The World of Steve Ditko, has already gone into its second printing. Anyone interested in Ditko needs to check it out. You can access the audio recording of the Ditko panel on Blake’s website on all things Ditko right here. On all levels, Ditko is a unique creator who has the courage of his convictions. I can’t help wishing, however, that he’d relent about keeping those “long-lost” Dr. Strange pages under wraps. I’d love to hear your thoughts on Ditko and his work – and if you’ve had your own personal Ditko encounters, please share them with me! *As stated in the San Diego panel, some actors look, to me anyway, like they were drawn by Ditko with a broad nose, strong jaw but short distance between mouth and chin. David Duchovny is one of those actors. As a general rule, positive space in a picture is composed of the items or subjects depicted within the picture’s frame (people, vehicles, buildings, etc.). 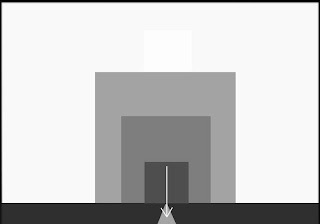 Negative space is the area not occupied by positive space items (often backgrounds like sky, simple landscapes, etc.). Artists and photographers can arrange the positive and negative space in their pictures to emphasize the picture’s storytelling and to create interesting compositions. Symmetrical balance is where the subjects are arranged so that they are in the middle of the picture frame or are even distributed throughout the frame. The subjects in a picture with asymmetrical balance are distributed in an uneven pattern. Here’s another way to think about balance in a picture - imagine the bottom of the picture frame as the surface of a see-saw or teeter-totter with a fulcrum under the middle. Now imagine all of the subjects in the picture frame falling straight down onto the surface of the teeter-totter. If the teeter-totter stays level, you have symmetrical design. If the teeter-totter drops to one side, you have an asymmetrical design. Keep in mind that the further away form the center/fulcrum an object is, the more downward pressure it will exert on the teeter-totter. 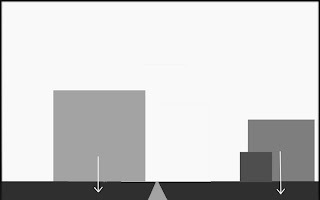 So, a large object near the center of the frame might be counterbalanced by smaller objects positioned farther to the opposite side of the frame. Symmetrical designs often impart a feeling of formality, stiffness or solemnity. Asymmetrical design can impart a very wide range of feelings. There is a sub-category to asymmetrical design – the seemingly oxymoronic “balanced asymmetrical design”. This is where the subjects are arranged asymmetrically within a picture but would still not cause the teeter-totter to tip. It’s good to be aware of these types of design balance when producing photos, illustrations or sequential media (comics, storyboards, film, etc.) If you are producing sequential media, it’s usually a good idea to mix the various balance types in order to get keep things visually interesting. 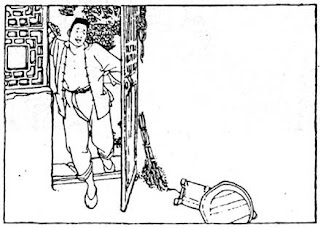 These panels by an un-credited Chinese comics artist show great design. It’s easy to see the positive and negative space in these frames! The frame on the top is asymmetrical design while the one on the bottom looks like it could be asymmetrically balanced. 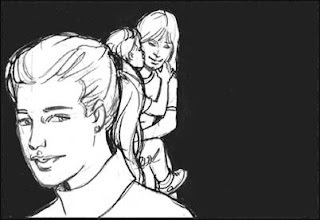 Whether you are producing a single illustration or a panel that’s part of a comicbook sequence, the way you format/frame the graphic can dramatically affect your viewer’s response. 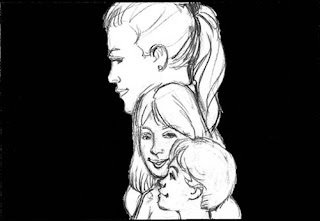 When a relatively large comics panel is preceded or followed by smaller panels in a sequence, it’s implied that the larger panel contains the most important or more dramatic information. We read sideways, left to right. So, long horizontal panels can give the impression of a slow pace due to the relatively long distance between the left and right panel edges. See below. Thin vertical panels give the impression of a fast/staccato pace due to the relatively short distance between the left and right panel edges. See below. Of course what the panel contains can dramatically affect the sense of time! See below. 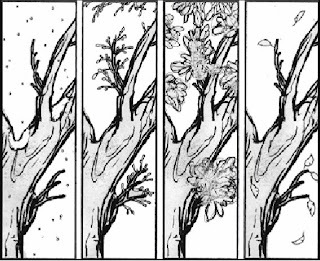 A tree viewed over the course of the four seasons certainly slows down the sense of time, even in thin vertical panels that normally indicate a fast reading clip. Please add your thoughts on this subject. 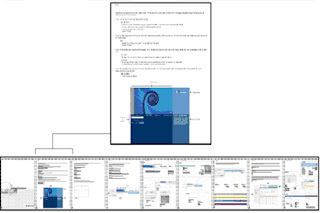 Most sequential visual storytelling media frame their visuals in rectangular formats — usually in horizontal rectangles. 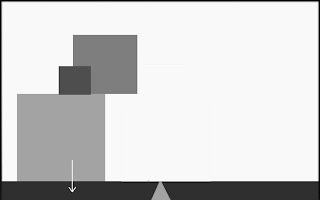 The audience has grown up looking at rectangular maps with North is at the top of a map, South on the bottom, East to the right and West to the left. Viewers of visual storytelling media have this map orientation stored in their subconscious and creators of visual stories can use it to their advantage. 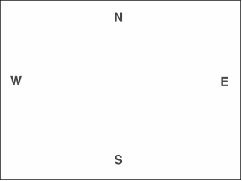 If it’s important to your story that the subject is traveling in a specific compass direction, you can position he/she/it in the frame to reflect that direction. Doing so will resonate with the map orientation in your audience’s head. 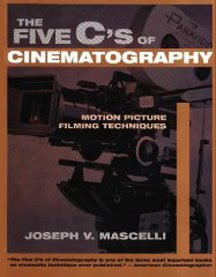 For example, cinematographers and directors of old western films usually showed wagon trains moving West with a right-to-left bias within the frame – echoing the western direction of a map. All shots in a sequence — long, medium and close-up — showing a wagon moving west would have the right-to-left action bias. 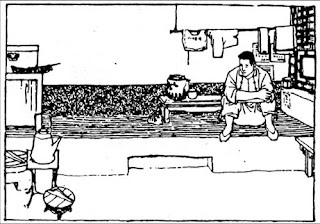 A neutral shot (Frame 3 in the sequence above) is where the action moves directly towards or away from the viewer. Neutral shots can be used in a sequence with an action bias that goes in any direction. However, when using a neutral shot, it is best to establish the action flow bias before the neutral shot and then reestablish the action’s bias after a neutral shot. 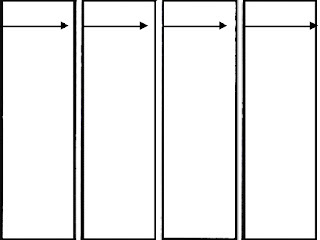 Note that in the case of Panel 3 above, even though the horses are neutral (moving directly away from the viewer), the dirt path they follow bends from left-to-right, maintaining the sequence’s action flow bias. 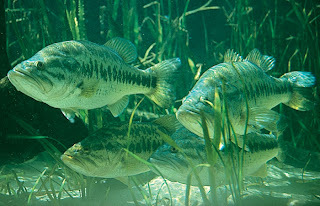 This topic is related to the larger issue of action flow continuity – the subject of a future post in this series. Have thoughts on this topic? If so, please post it in the comments.